What Flew and What Flopped Among Obama’s 2012 SOTU Proposals? 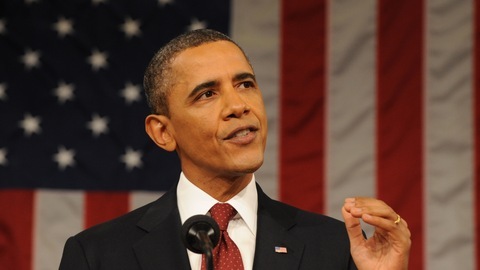 President Barack Obama speaking during the 2012 State of the Union. Photo by the PBS NewsHour. President Obama put forth a set of liberal policy items focused on economic innovation and restoring the American economy in his 2012 State of the Union speech, ushering in an election year when economic health seemed preeminent in the minds of voters. He championed the concept of the American Dream, supporting tax credits and education investments he said would keep that dream a reality, while pushing for investigations into banks’ risky lending practices. Ahead of the long campaign — and the even longer “fiscal cliff” debates — he sought to appeal to the interests of the middle class, invoking concerns about outsourcing, job creation and college affordability. But with an election year came increased challenges to seeing these proposals come to fruition, especially with members of Congress wary of any votes that could come back to haunt them in November. So which of these economic proposals were enacted, which died along the way and which were never heard of again? Not Achieved: Sen. Debbie Stabenow, D-Mich., introduced the Bring Jobs Home Act, or the “insourcing” bill, which offered tax credits to businesses bringing outsourced jobs back to the States and stripped tax credits from companies spending money to ship jobs overseas. But Senate Republicans blocked the bill in July. Achieved: In February 2012, the president created the Interagency Trade Enforcement Center by executive order. As China’s economic threat emerged as an issue in the election, the administration brought a trade case against China, asking the World Trade Organization to talk with Beijing about easing Chinese restrictions on exports on rare-earth elements. Not Achieved: At Northern Virginia Community College in February, President Obama proposed an $8 billion “Community College to Career Fund” to subsidize job training programs for two million workers. No congressional action has been taken on the fund. Achieved: In late June, Congress passed a $127 billion transportation measure and student loan extension bill, extending the 3.4 percent interest rate on Stafford loans for one year, just ahead of the July deadline. Achieved: The fiscal cliff deal extended the American Opportunity Tax Credit through 2017, allowing families to take a tax credit up to $2,500. The Tuition and Fees Deduction was also extended through 2013. Achieved: President Obama signed into law the Jumpstart Our Business Startups (JOBS) Act in April. The law eases funding restrictions for small businesses. Not Achieved: Congress did not move on Obama’s bill that would have allowed more home owners to refinance. He’s likely to address mortgage relief with executive action. Achieved: President Obama appointed N.Y. Attorney General Eric Schneiderman to oversee the Justice Department’s federal mortgage task force, officially known as the Residential Mortgage-Backed Securities Working Group. The task force filed suit against two major banks, first Bear Stearns and Company — now part of JPMorgan — and Credit Suisse for misleading investors. Achieved: Congress passed an extension of the payroll tax cut in February. The tax cut lapsed at the end of 2012 since the extension was not renewed as part of the “fiscal cliff” deal. Not Achieved: The Senate defeated the minimum tax on the wealthy, otherwise known as the Buffett Rule. In the fiscal cliff negotiations, Obama was forced to adjust upward his initial $250,000 threshold for Bush tax cut extensions to $400,000 for individuals and $450,000 for couples. Achieved: President Obama signed the STOCK Act in April, banning members of Congress and their staff from trading non-public information to enrich their portfolios. Not Achieved: President Obama and Congressional Democrats didn’t get enough procedural votes in the Senate for their bill to cut oil subsidies to survive. The fiscal cliff deal extended tax credits for wind energy. Not Achieved: Republicans opposed the costs associated with Obama’s Veterans Job Corps bill, which failed to receive the 60 votes in the Senate it needed to move forward. Sandi Fox and James Hercher contributed to this report.